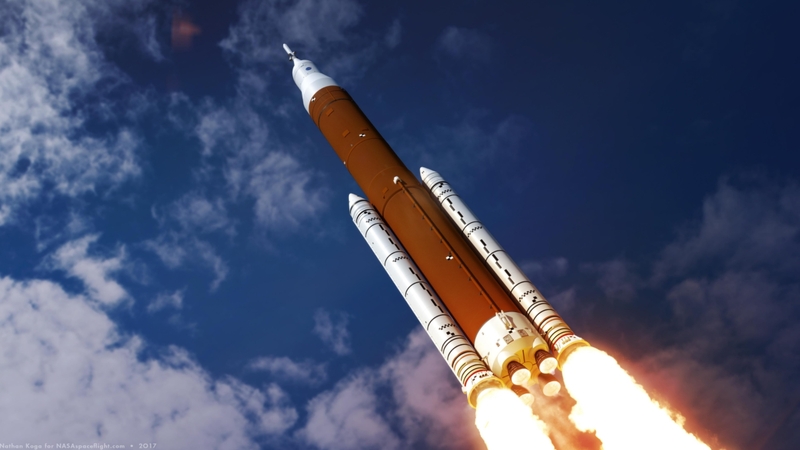 NASA and Space Launch System (SLS) Core Stage prime contractor Boeing are making progress building their first vehicle, learning how to put it together and rewriting the assembly instructions on the fly. 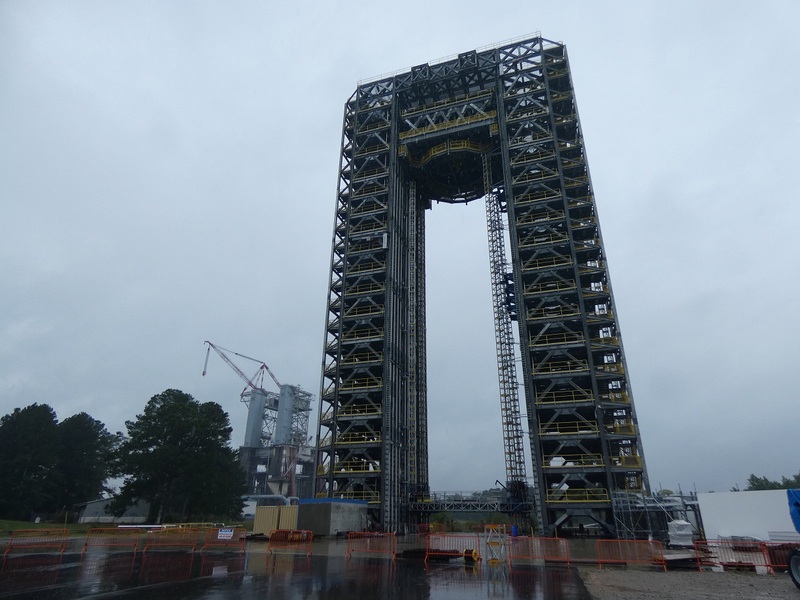 The major elements of Core Stage-1 (CS-1) and its companion structural test articles (STA) are being built up in work areas at the Michoud Assembly Facility (MAF) in New Orleans. Not far from each other, work to cover the outside of the flight propellant tanks with their thermal protection system (TPS) is going on in parallel with efforts to outfit the inside of the other multi-story tall structures with all the parts, plumbing, and wiring needed prior to being connected together. The engine section is still the critical path for completion and remains the biggest challenge, with most of the parts, propellant lines, and wiring going into it. Work is now going on around the clock to finish the stage for delivery by the end of the year or early 2019. 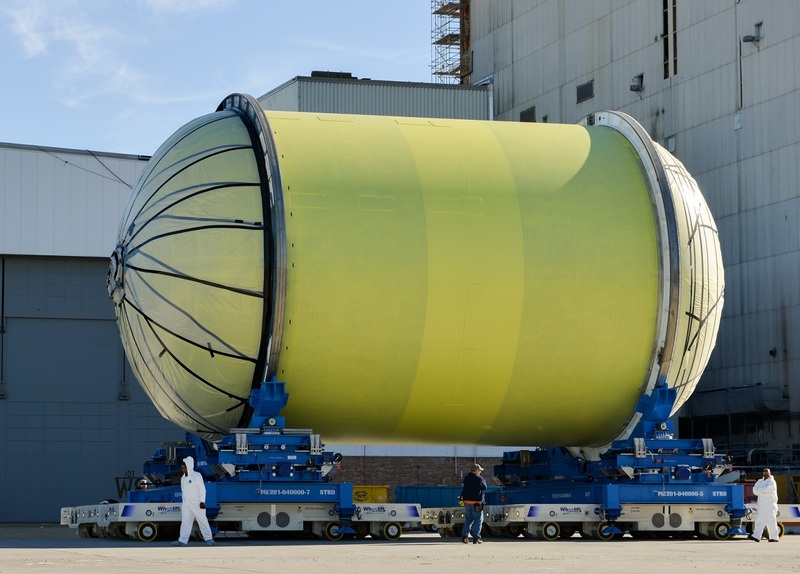 In order to certify that the Core Stage is ready to fly for the first time, a nearly complete second set of Core Stage structural test articles (STA) was manufactured along with the flight articles. The STAs are being assembled to be pushed and pulled, twisted and turned to make sure the new rocket can handle the forces it will see in flight, with an added factor of safety. 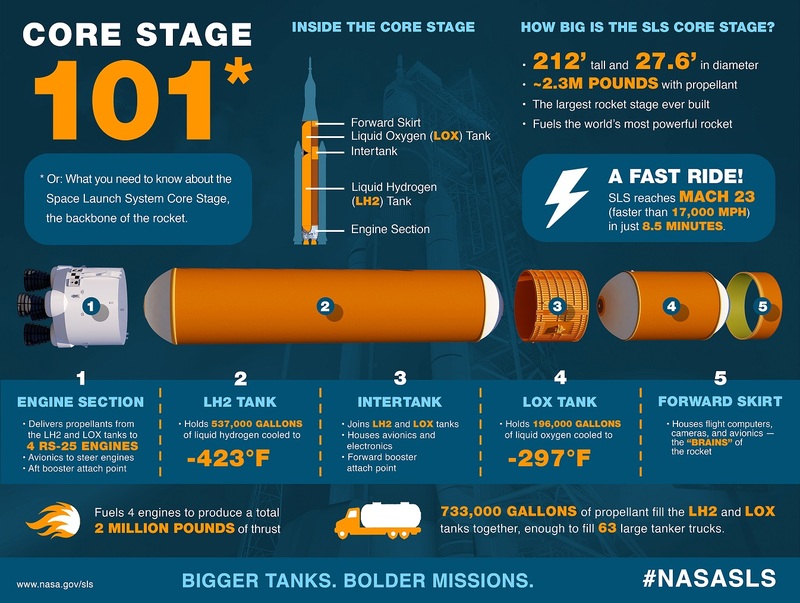 The Core Stage consists of five major structural elements, the forward skirt, the liquid oxygen (LOX) tank, the intertank, the liquid hydrogen (LH2) tank, and the engine section. Analysis showed that the forward skirt had a significant amount of structural margin and didn’t require the expense of full structural testing. Last week, the second of four STAs left the MAF assembly buildings for testing to be done at the Marshall Space Flight Center in Huntsville, Alabama. The intertank STA, consisting of the intertank article bolted to structures that simulate the elements adjoining it on the Core Stage (the LOX tank on the top and the LH2 tank on the bottom), was rolled to the Pegasus barge docked at MAF in the first use of the Multipurpose Transportation System (MPTS) hardware that will drive Core Stages to and from the barge at NASA testing and launch centers. Construction of the intertank STA was completed during the last half of 2017, following assembly of the flight intertank. “It turned out because of some manufacturing nuances [that] we ended up making the flight intertank before the structural or qual intertank,” Pat Whipps, the SLS Stages Resident Manager, said in an interview with NASASpaceflight.com in his office at MAF. The second structural assembly took significantly less time, in part because the Core Stage team had gained the experience of going through the whole process with the first. “We did see the manufacturing efficiencies from a structural assembly standpoint were definitely being realized,” he noted. The intertank STA follows the engine section STA, which shipped to Marshall last Spring and recently completed a successful test series. With the STA on the barge, Pegasus and crew are on their way up to Marshall, hoping that conditions will permit them to make it there in the next week or so. 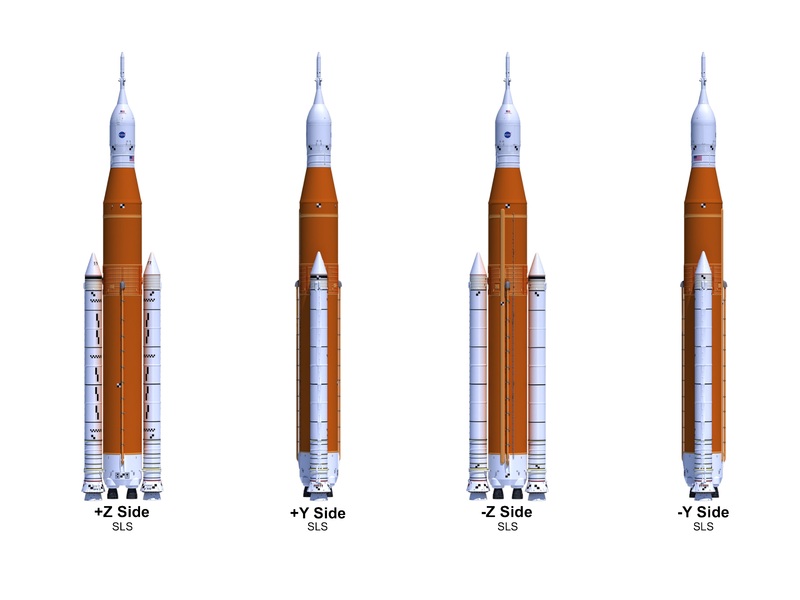 Plans are for the STAs for the two large propellant tanks to follow at the end of the summer. The LH2 tank STA is the most critical of the two schedule-wise, because it completes the three parts of the Core Stage structure (with the intertank and engine section) that will take loads during the Stage Green Run test, when the CS-1 flight vehicle is test-fired while held in a test stand at the Stennis Space Center in Mississippi. Analysis of the structural testing of those three elements is one of the requirements for proceeding with the Stage Green Run test-firing. 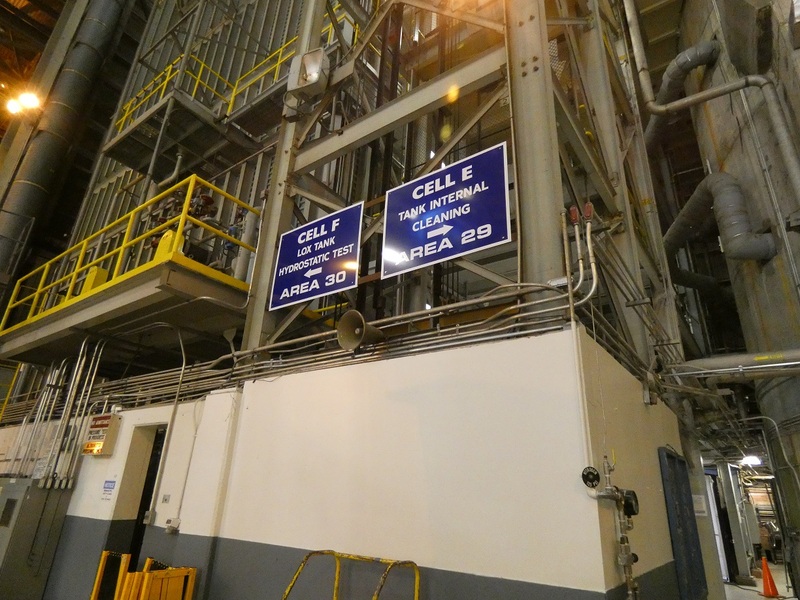 Testing and analysis of the LOX tank structure is still required prior to the first launch. 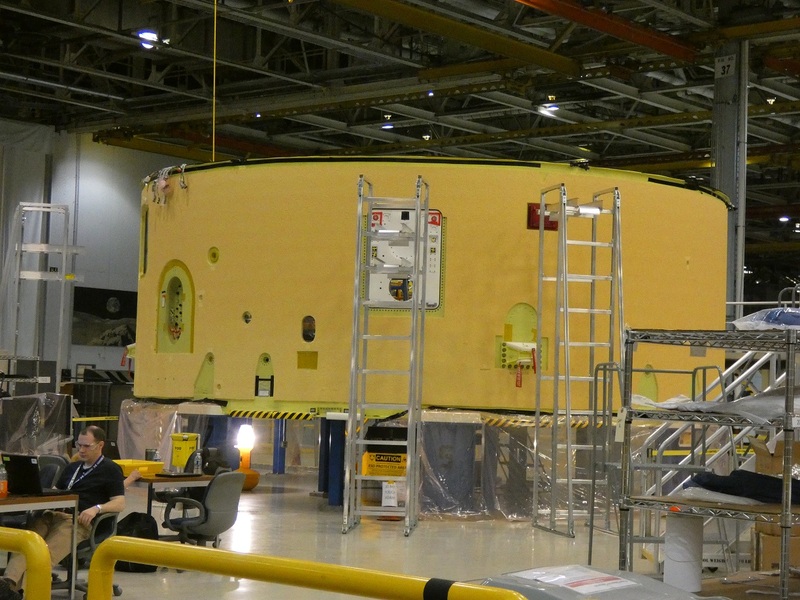 The LH2 tank STA is currently being covered with instrumentation for the upcoming structural testing. “The structural test article hydrogen tank will have the qual hydrogen tank and the two simulators on top and bottom simulating the intertank above and the engine section below,” Whipps noted. 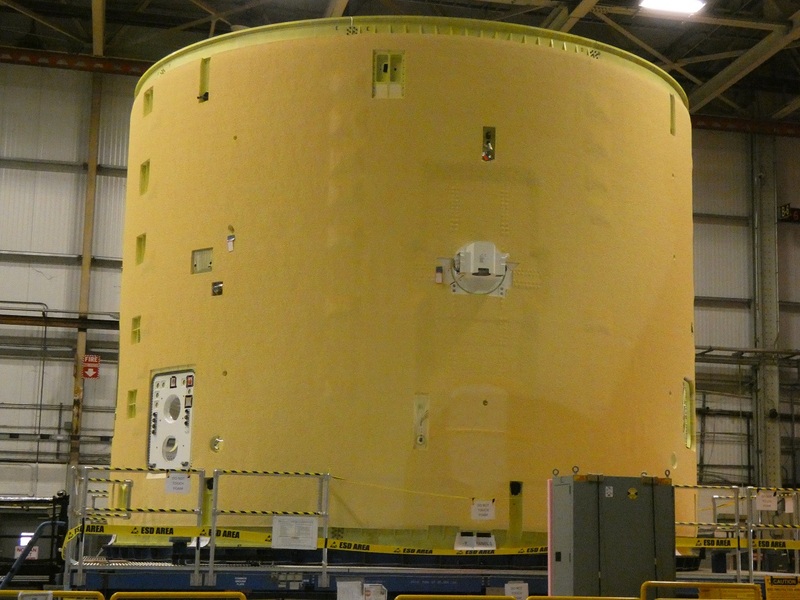 The plan now is for the LH2 and LOX tank STA not to receive a full application of TPS foam; they will be configured similarly to the first two STAs, with a full primer coat to prevent corrosion, but only limited foam applications in areas that will see cryogenic temperatures during structural testing. The LOX tank STA just completed proof testing in Cell F of Building 110, one of two large vertical assembly buildings at MAF. “We’ve completed its proof test, which was a pretty rigorous one,” he said. The tank is still in Cell F, waiting for an opportunity to be moved to another location where the welds that the proof testing are evaluating can be reinspected to verify they fully passed the test. Most of the first flight related Core Stage hardware is currently still in process at MAF, and Building 110 operations were going on simultaneously with tanks in multiple cells while the IT STA was moving from stacking in still other cells onto its transporter in the transfer aisle. 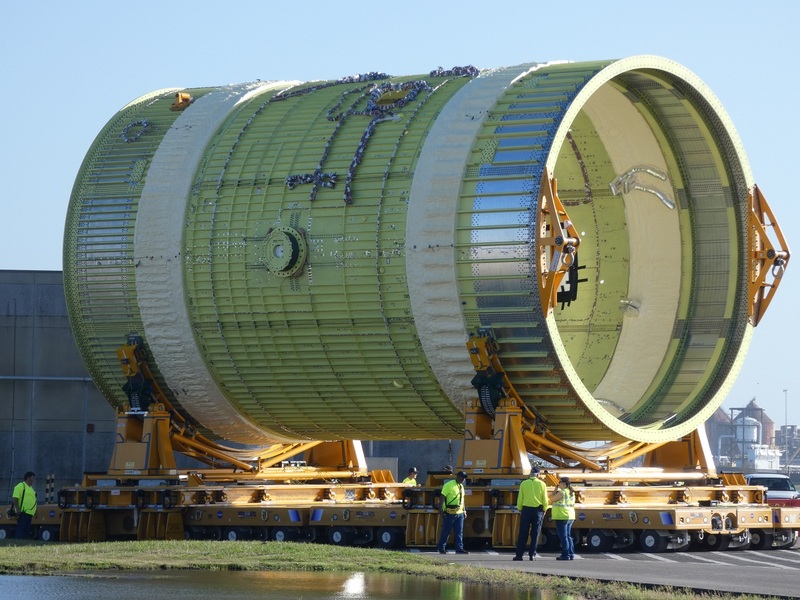 Once the other large hardware are moved to their next locations, the LOX tank will get its turn. Meanwhile, the elements that make up the top half of the rocket are also being processed in parallel to reach the point where they can be mated together. The Core Stage is also categorized into two types of elements, wet and dry. The liquid propellant tanks are the wet structures and are mostly bare inside. The forward skirt, intertank, and engine section dry structures are the opposite, with their internal volumes taken up not just by the tops and bottoms of the propellant tanks, but by anything and everything else necessary. The three dry structures are being worked on simultaneously in separate, but nearby areas in Building 103 at MAF. Much like the what is behind the drywalls in a house, the dry structures are full of internal supports, electronics boxes and wiring, computers and data cables, batteries, plumbing for the propellant, tanks for other fluids and their plumbing, and critical machinery. Unlike most houses these structures will fly at high speeds, so they have versions of that equipment specialized for that purpose. 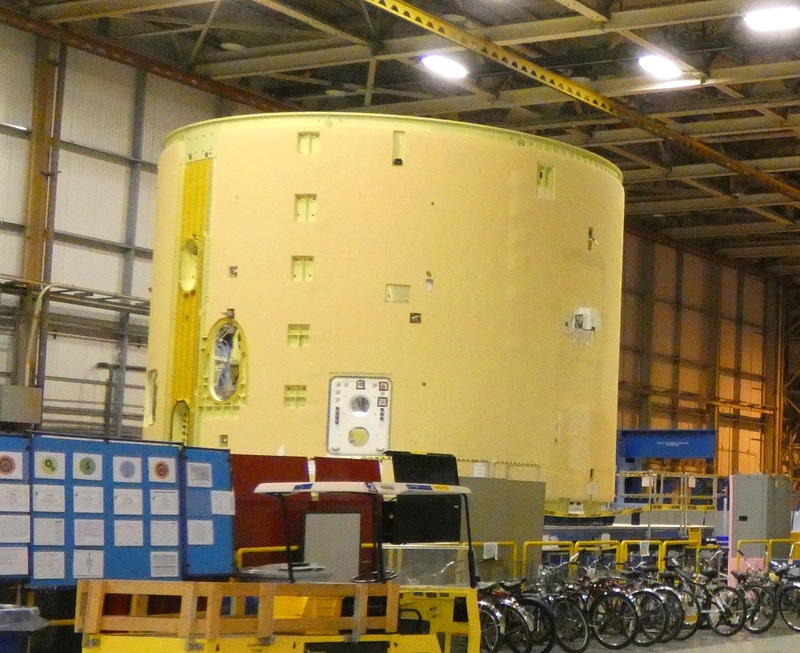 The forward skirt and the intertank are the two dry structures that will be mated to the LOX tank to form the top half of the rocket, called the forward join. In contrast to the STAs, which are almost naked except for primer and some instrumentation, work on the forward skirt and the intertank has progressed to the point where they are both being filled with all that equipment. “[The forward skirt is] the most mature of the Core Stage-1 elements,” Whipps said. “It has been fully primed, fully TPS covered, the umbilical plates are on, the majority of the wiring is installed. As we’ve been qualifying the different parts, the component boxes like the doubly-redundant [flight] computers, etcetera, many of those have come to MAF from where they’ve been under test all over the country. When completely outfitted, the forward skirt will contain the three flight computers at the center of the vehicle’s internal network, the inertial navigation unit, one of the command and telemetry controllers, and one of the radio transmitters that sends vehicle data to the ground. 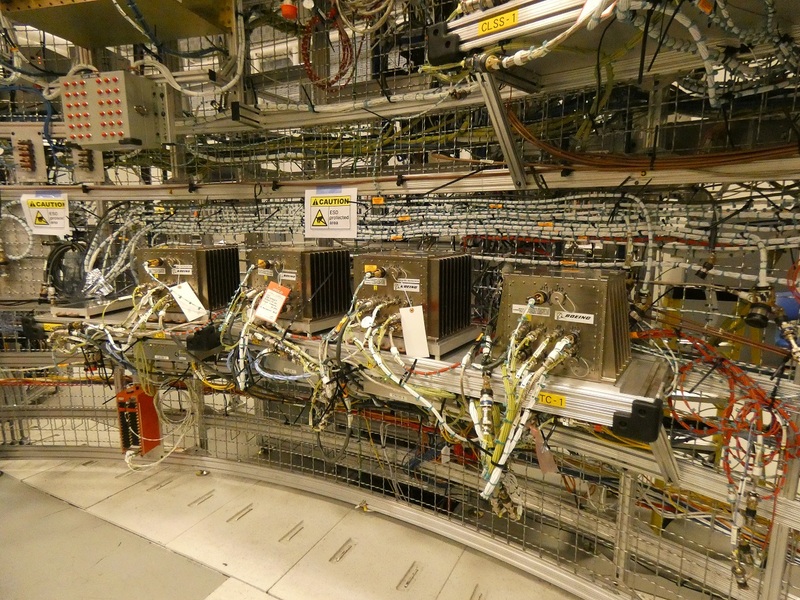 All of the avionics boxes will be connected to data and power supplies positioned through the rest of the vehicle and distributed along the systems tunnel that runs the length of the stage on the -Z side. The forward skirt sits over the forward dome of the LOX tank; in addition to the avionics inside, it also has an umbilical plate for ground-supplied air-conditioning and a port to allow the gaseous oxygen boil off in the LOX tank to be periodically vented overboard. Once the forward skirt avionics and wiring have all been integrated, the subassembly will go through a functional test. “A lot of that won’t be necessarily real sophisticated, a lot of it might not be looking at the full capability or processing of the computers,” Whipps explained. Down the aisle and around the corner from the forward skirt in Building 103, the intertank is also being outfitted with its internal elements before it is ready for stacking. In addition to the large, structural thrust beam running through the intertank that attaches to the top of the two SRBs, the inside also carries major propellant and avionics components. The aft dome of the LOX tank and the forward dome of the LH2 tank take up much of the volume inside the intertank, and two 16-inch diameter feedlines run from the bottom of the LOX tank into and out of opposite sides of the intertank to feed the oxidizer to the engines at the bottom of the rocket. In the remaining space, the intertank houses the four battery units that supply electrical power to the vehicle, along with companion power distribution controllers. Also located in the intertank are the system that monitors the propellant level sensors in the tanks, one of the rate gyro assemblies, one of the data acquisition controllers, a second command and telemetry controller, and a camera controller. Technicians are working with a detailed set of instructions on the steps to put all the parts and wiring inside, in the right places, and in the right sequence. As with other tasks they are going through for the first time, they are finding issues with some of the instructions and having to fix or adjust them on the fly. “A lot of what we’re doing in there is…first time work,” Whipps underscored. The intertank will go through a similar, subassembly-level functional test to verify it is ready for stacking. 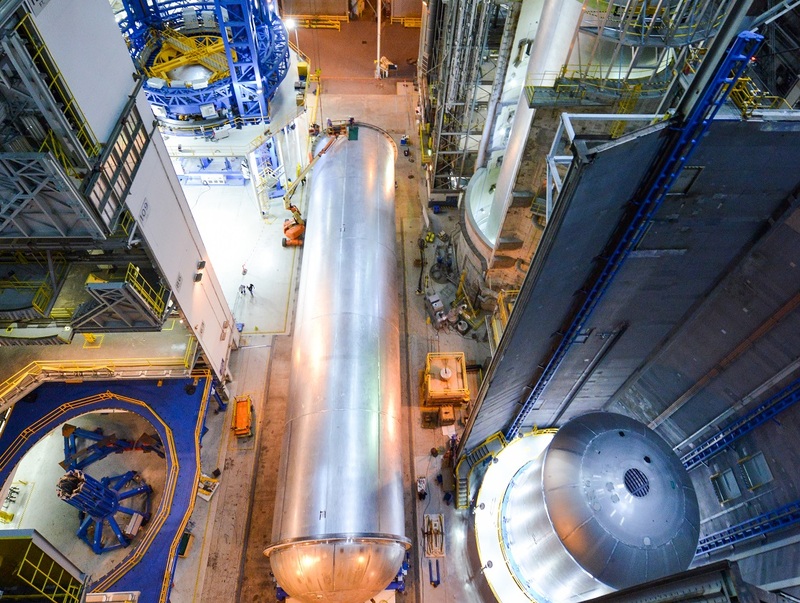 The flight LOX tank has outpaced its twin STA structure; it has gone through proof test, post-proof non-destructive evaluations (NDE), and the Cell E “washing machine” in Building 110 that cleans the inside of the tank. It is now in Area 6 where a round of sensor installations was being completed. The next major step is thermal protection system (TPS) applications, first going to Building 131 next door to be primed in Cell P and then covered with spray-on foam insulation (SOFI) in Cell N.
Before the flight tank can be moved next door from Area 6 to Cell P, like its sister STA, it has to wait for a transporter ride. “It’s kind of held in sequence with this move of the large chess pieces around here that we’ve been doing [for] the last week or so and [are] continuing to do,” Whipps noted.